← Way to Go, Jean! 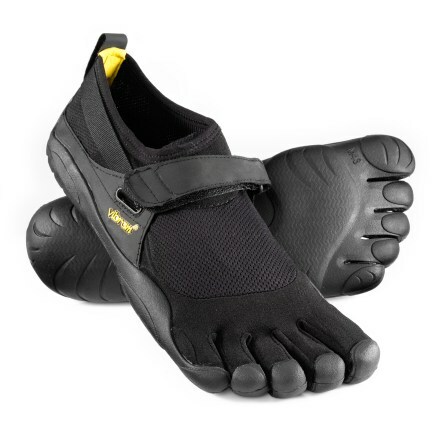 After getting good recommendations and reading rave reviews, I decided to get a pair of Vibram FiveFingers. If you’re unfamiliar with the shoe, here’s a pic. These were originally invented for sailing, but soon after runners adopted them to help train their feet and legs during barefoot running. The concept of the shoe is that you’re as close to barefoot as safety and hygiene allows. A friend of mine wore them while we hiked recently and encouraged me to try them out. It took nearly all winter to get a pair in my size, and I had to buy women’s at that. I wore them during different activities and workouts last week to try them out. Now I know why they’re so popular! Once you figure out how to put them on, you won’t want to take them off! My wife forbids me to wear them unless I’m working out, and mother-in-law doubled over laughing at my “Mickey Mouse feet” when she saw them. Don’t expect to win any fashion awards with these things. They are fun to wear though, so be on the lookout for posts about my first five days with Five Fingers. For more info, here’s the official link to the product page.